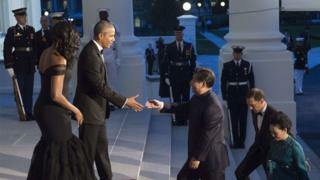 So said President Obama on Friday, standing alongside President Xi at the White House. This line didn't make the news. After all, Mr Obama repeats it whenever he meets his Chinese counterpart. But the qualified American welcome to the rise of China is still the principle which underpins the most important bilateral relationship in the world, and it is the principle which has guided American policy on China through eight presidencies and four decades. China's trade with the US alone has risen from $2bn in 1979, when relations were established, to nearly $600bn last year. The relationship is broad and deep, marked by intense co-operation but also intense competition. Both presidents are conscious of the dangers of the former giving way to the latter. Thucydides trap? What was a 2,000-year-old Greek historian doing in a speech otherwise peppered with references to American writers and American culture? The trap named after him describes the structural stress caused when a rapid rise - like China's - changes the balance of power with an established rival that escalates to war. The rising power wants a bigger say in how its world is managed and the existing power holds onto the status quo. Thucydides identified it as the trend which led an up-and-coming Athens to war with Sparta in the 5th Century BC. It appeared in Mr Xi's speech nearly 2,500 years later because some strategic thinkers believe that what was true of Athens and Sparta is true of China and the US today. In some ways the dangers are arguably greater today. Sparta and Athens were at least close in language and culture. Britain and Germany before the First World War also shared many values, and contemporaries could see that strategic competition was in the interests of neither and that war would be catastrophic. But that didn't mean they could prevent it. So as President Obama and President Xi performed the rituals of the visit, complete with 21-gun salute and state dinner, what both sides can agree on is the urgency of avoiding the Thucydides trap. Sustaining the US welcome for a rising China requires them to find and strengthen areas of co-operation. Hence announcements on climate change, with President Obama welcoming President Xi's commitment to a carbon trading programme. They also celebrated co-operation on Iran's nuclear programme and said they would continue to work together to tackle the North Korean nuclear problem. China signed off on a multi-billion dollar deal to buy Boeing aircraft, making the point that there are concrete benefits in American jobs and profit from good relations with China. President Xi worked hard to keep the tone positive. Chinese good manners dictate that on great ceremonial occasions, the visitor should avoid unpleasantness and find nice things to say about the host. So he reeled off a list of his favourite American authors and movies. But when President Xi goes to Russia he loves Pushkin and Tolstoy, when he goes to France it's Moliere and Dumas. Overall, the Obama administration tried to put a brave face on the usefulness of this summit, but it is the third major encounter in three years between the two presidents and the relationship has not lived up to early American hopes. President Obama has invested heavily in trying to build a personal rapport, and on this occasion too they had a two-hour conversation over a private dinner. But one is seven years into his presidency with just a year to go, the other is three years in with seven still ahead. President Xi's foreign policy is more confident, articulate and focused than that of any of his predecessors. His assertiveness has caught the Obama administration off guard, whether it's the ambitious island building in the South China Sea, a new development bank to challenge US dominance of global financial institutions, or the push to reshape the physical and diplomatic architecture of Asia through China's "One Belt One Road" strategy. Nuclear technology - China's next great export?